Complex, intelligent, distributed systems in dynamic environments, such as the power grid need to be designed to adapt autonomously. Self-management, in particular of large scale adaptive systems such as the power grid, is necessarily distributed. Agent and peer-to-peer based decentralized self-management can change the future of energy markets in which the power grid plays a core role. Assuming that both consumers and providers of energy are autonomous systems, represented by software agents or peers capable of self-management, virtual organizations of systems can emerge and adapt when necessary. Communication structures between systems, e.g., hierarchical or clustered organizations, can emerge, organizations between and within which systems can choose to cooperate and coordinate their actions, or compete. 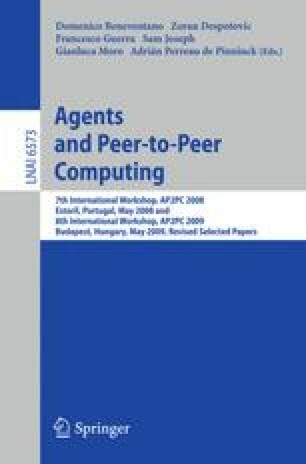 Overlay structures (as defined within p2p research) define such adaptive communication structures, multi-agent research provides interaction patterns. Global goals are achieved by local management on the basis of local goals and knowledge. The appropriate delegation of managerial responsibility determines the control structure. Aggregate information differs depending on the position of a system in an organization, the aggregation mechanisms and policies.